Sadness, disappointment and frustration are not at all the vibes that will create what it is you desire to manifest and experience. They are the opposite. Just sayin'. P.S. Fortunately, none of those feelings can exist in Easy World, your divine manifesting place! Shake it off/cry it out/punch a pillow and get yourself back to EW tout suite! Start Your Day With a Love Letter from Easy World! 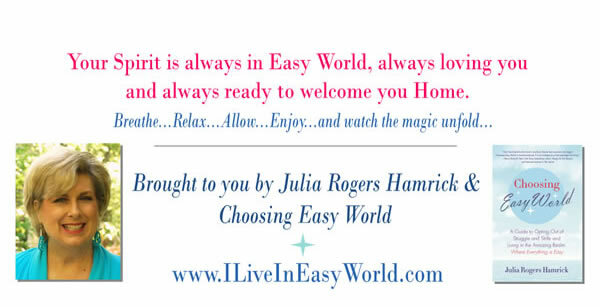 This is a separate subscription from the one you may already have through JuliaRogersHamrick.com — you will NOT automatically be on the new Easy World list, so be sure you sign up for it if you want to be empowered in this way! And if you're not yet on my main list, which gets you my newsletter, etc., I encourage you to sign up for both!